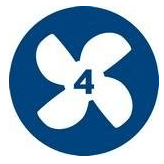 4.1 !!!!!!!!!!!!!!!! Attention Please !!!!!!!!!!!!!!!!!! Attention Please !!!!!!!!!!!!!!! The Philips AC1215 Air Purifier is a mean machine. 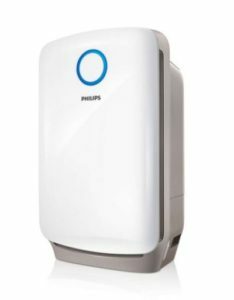 It is a member of the Philips 1000 series air purifier family. It is designed to be as efficient as possible even if it means sacrificing on the looks department. The front side of it has fans which pull the room’s air through the filters. The back vents thrust the clean air upwards back into the room. It is way better than most other Philips models like AC4014, AC4012, AC4025 or AC4072. 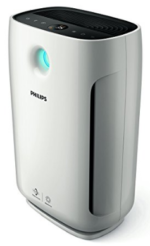 In terms of value for money and sensory features, only the Philips AC2887 2000 series air purifier takes a lead from it. Read this review to know more. If you are looking for an air purifier with True-HEPA Air filters and the trust from Philips, then go for it. 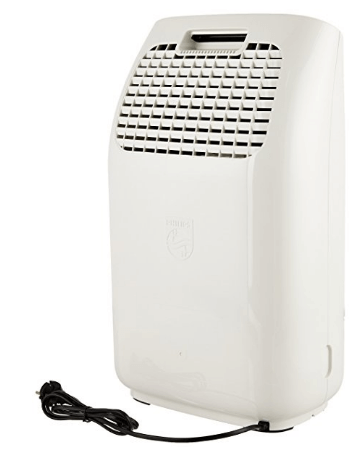 There are not many air purifiers out there which have True-HEPA filters. The H13 class filters can clean 99.95% of 0.3 micron sizes particles from the air. Products that claim to be “HEPA-type”, “HEPA-like”, “HEPA-style” or “99% HEPA” do not satisfy the standards set for HEPA filters. The VitaShield Intelligent Purification System can removes 99.97% allergens and ultra-fine particles as small as 0.02 microns, 100 times smaller than PM 2.5. 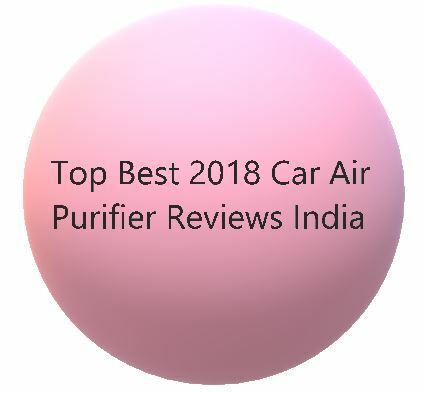 The Air purifier is certified from AirMid, ECARF and AHAM. As pointed out above, there have not been any compromises made with the efficiency of the air purifier and its working. At first look, you may feel its exterior to have too many holes. You may even feel the absence of any designs or patterns for beautification. The body is white with a black control panel mounted at the top. 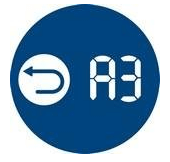 The CADR for Philips AC1215 is 270 m³/h. The Coverage Area is upto 677 sq.ft. This CADR and coverage area is among the best among all brands with this price tag. The performance of AC1215 has been excellent and consumer reviews reflect the same. The whole lot of sensors and features are greatly useful. There is hardly anything missing except for the humidifying function. 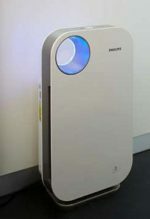 The air purifier may take some time in displaying Blue color indicating clean air. The cause may be too much pollution levels in the air or chilly weather conditions. As recommended for all other air purifiers, keep your rooms closed completely for best results. There are 3 filters in the unit viz. Pre-filter, HEPA and Activated-Carbon filter. You may have seen up to 7 stage filtration in air purifiers. The good quality HEPA filters in AC1215 make up for the extra layers. Also, it has a thicker HEPA filter. The Pre-filter should be washed regularly under running water. This prolongs the longevity and improves the performance of filters. The filters are easily available of Amazon. The Carbon filter costs INR 1,980 while the HEPA Filter costs INR 2,237. It comes with a 2 year warranty. In special schemes, 3 year warranty is also offered. 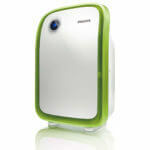 The air purifier monitors the air quality and also senses the ambient light. It automatically adjusts the fan-speed and dims the lights automatically at sleep time. Allergens are allergy causing agents which can cause allergic reactions. The Philips AC1215 has a dedicated allergen mode. It facilitates detection and removal of allergens from the room’s air. For complete peace of mind, just press select the AUTO mode. The air purifier automatically handles the monitoring and air purification. 4 different fan speeds including ultra-silent and turbo modes to suit varying room sizes and pollution levels. The noise level are only about 30db at the lowest fan speed. 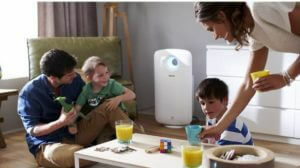 The air purifier can get noisy when the air is too polluted and it has to work harder to clean it. With someone smoking in the room or in other such cases, how can it sit quietly! The healthy air protect alert lets you know promptly when it is time to replace any of the filters. 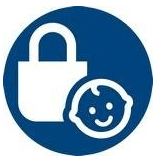 Child lock to prevent unintended changes in settings by children. Real-time PM2.5 air quality monitoring and display feature displays the air quality in 4-color air quality indicator. 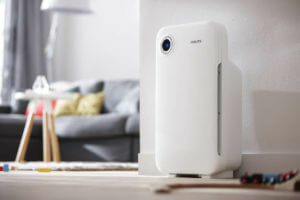 The Philips AC1215 air purifier could prove to be a great addition to your rooms. Looks should be the last consideration when the purpose of the device is something else. Not to mean that it is ugly or something, but just as an advice. The cost is very reasonable and at INR 9,165 as of October 2017 (Check current price), it comes loaded with good performance and technology. 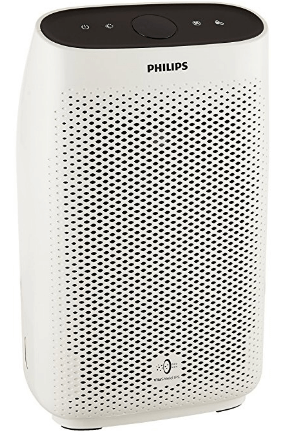 We recommend the Philips AC1215 air purifier wholeheartedly. !!!!!!!!!!!!!!!! Attention Please !!!!!!!!!!!!!!!!!! Attention Please !!!!!!!!!!!!!!! “How? It’s simple. 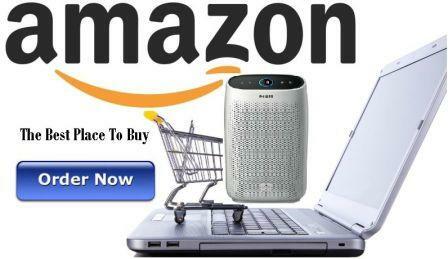 Join us on FACEBOOK group ETHCASH and write what you wish to buy. Once you buy any product, we would like you to write a review for us. If we find it good, we’ll reward you in your Paytm wallet ∗T&C apply.